It is my favorite time of year. The air is crisp and fall flavors of apples, pumpkin and warm spices abound. Lately I have been taking advantage of the cooler weather by enjoying hikes in the woods with my beagle, Sawyer. I usually do not last long but we enjoy exploring and reflecting the peace nature brings (although, if you ask him he just likes to sniff!). If we come across a steep terrain Sawyer will eagerly run up a few feet, then turn and wait for me, tail wagging, as if to say “hurry up mommy!”. Once we get home we both collapse and he sleeps the day away. I always seem to be extra hungry on our hiking days and this light pasta dish is a delicious way to end a productive morning or spend a Sunday afternoon. The wonderful thing about this is that the tomatoes can be slow roasted ahead of time (they take 2-3 hours) and stored in the fridge in an airtight container. To make a quick weeknight meal you only need to roast the sunchokes and cook the pasta. If you cannot find sunchokes you can use canned or frozen, thawed artichokes instead. 1. 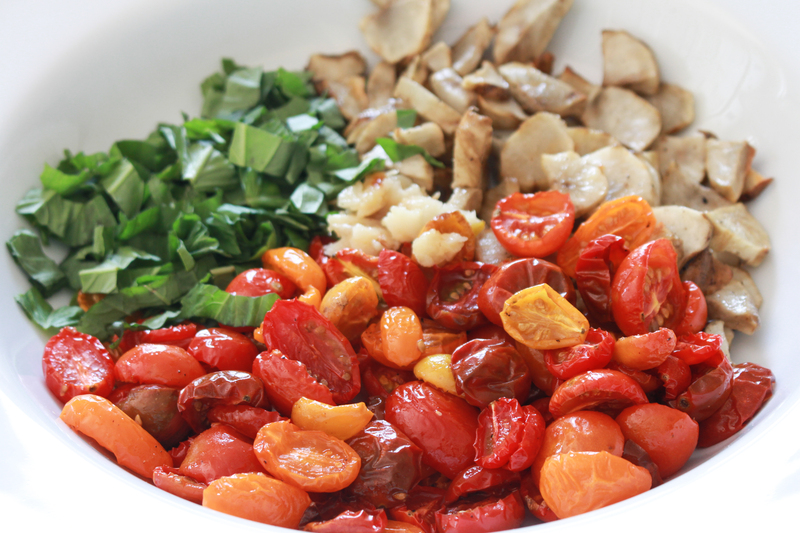 To roast tomatoes, line a sheet pan with foil and preheat oven to 225 degrees F.
2. Slice each tomato in half and place on sheet tray. Drizzle with a touch of olive oil and sprinkle with a pinch of salt. Roast for 2-3 hours, checking every 15 minutes after 2 hours so they do not burn. Tomatoes will be shriveled and deepen in color. Store covered in the fridge until you will use them. 3. To roast sunchokes and garlic, line a sheet pan with foil and preheat oven to 350 degrees F. Drizzle lightly with olive oil, sprinkle with salt and roast 35-45 minutes until tender. Allow roasted garlic to cool slightly before squeezing it out of the peel. It will feel similar to squeezing toothpaste out of the tube. 4. Cook pasta according to package directions, reserving some of the cooking liquid before you drain it. 5. 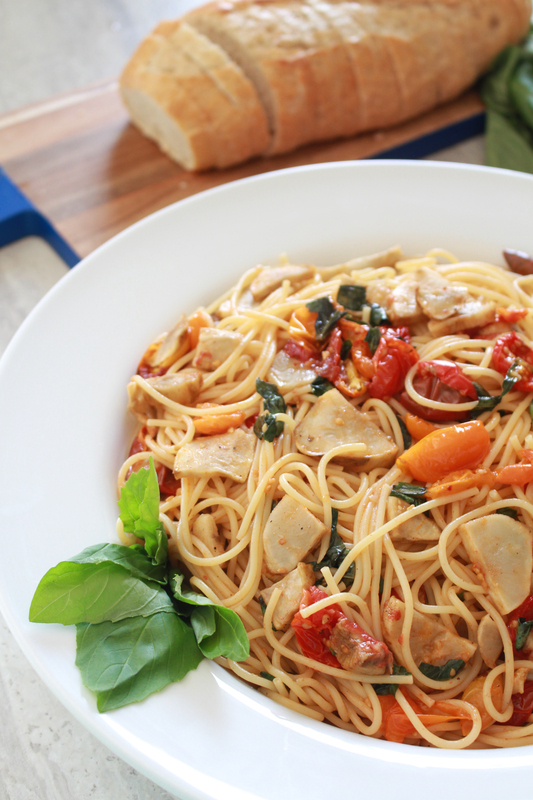 Toss pasta with tomatoes, sunchokes, garlic, basil and parmesan cheese. If you find it is a little dry, add the pasta water a spoonful at a time. 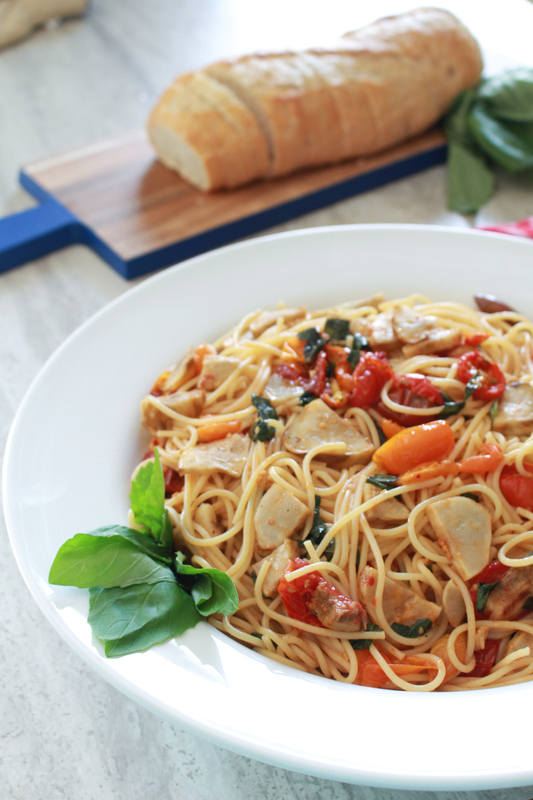 This entry was posted in Pasta Dishes, Vegetarian and tagged fall, pasta, summer. Bookmark the permalink.